Now that the ASUS Padfone 2 is finally official, it's time to get a detailed idea of the device's pricing and availability. As we already told you, the smartphone is initially going to be available in 32GB and 64GB variations, with a 16GB coming out later (we assume by Christmas). ASUS will launch the Padfone 2 and its tablet station first in Europe (Bulgaria, Estonia, Finland, Germany, Hungary, Italy, Poland, Portugal, Romania, Spain, and Sweden) and Asia (Hong Kong, India, Japan, Malaysia, Singapore, Taiwan, Thailand, and U.A.E). The smartphone/tablet should be available there in the beginning of December. The US hasn't been mentioned in the official press release, but we got a word from an ASUS manager at the event, saying the Padfone 2 will debut in the US by the end of the year as well. As for pricing, the 32GB Padfone 2 (including a the 10.1" tablet station) will retail in Europe for €799, while the 64GB model will be €899. We guess once the 16GB version comes arounds, it'll cost around the €699 mark. 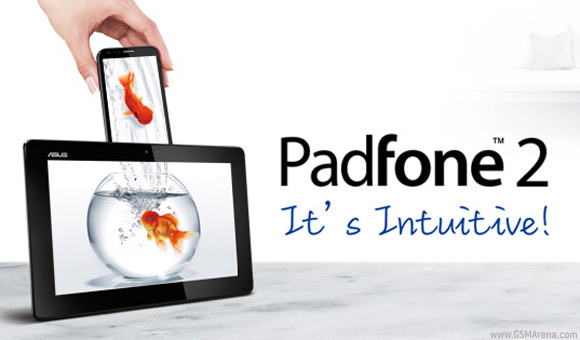 In Asia, the Padfone 2 tablet station will be sold separately for NT$8,990 ($310). There, the unsubsidized Padfone 2 smartphone will retail for NT$17,990 ($620) and NT$21,901 ($750) for the 16GB and 32GB models, respectively. However, should customers purchase the Padfone 2 together with the tablet station, the latter will be sold at NT$6,000 (around $210). Information on subsizided US versions isn't yet available, and we are yet to see which US carriers will pick the device up. We are also yet to see how the Padfone 2 will compete with the upcoming LG Optimus G in Europe too. The Padfone 2 is powered by a beefy 1.5GHz quad-core Qualcomm Snapdragon S4 Pro (APQ8064) chipset with Adreno 320 GPU and 2GB of RAM. This awe-inspiring chip helps the Padfone 2 run Ice Cream Sandwich with absolute ease. Naturally, an update to Android 4.1 Jelly Bean is planned, too. For more information and first impressions, check out our full ASUS Padfone 2 hands-on.